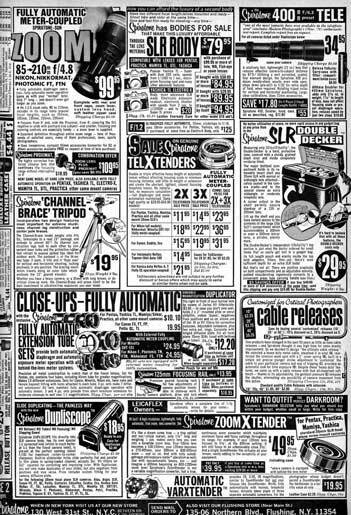 The ad on the right appeared in April 1978 of Modern Photography. That stabilization processor was really something. 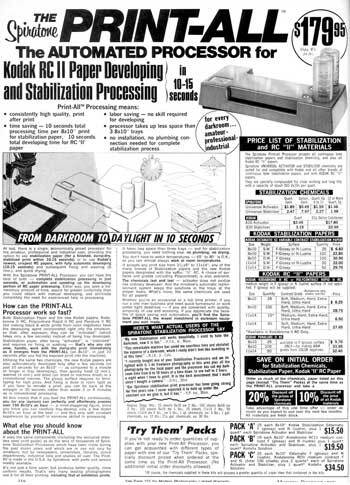 You used developer-incorporated paper, which Kodak called "Rapid," exposed it and stuck it in the processor. It rolled out the other side and you let it dry. No contact with chemicals. No trays or drums. It worked but the images were blah; you didn't get deep tonality out of it. But it was really meant for photofinishing or proofing, where you needed to knock stuff out quickly and image quality was not a high priority. One of the interesting side-effects of this was that Rapid paper behaved like printing-out paper: it would turn dark in sunlight. You could make contact prints or photograms using the sun. A photo teacher took an box and made a pinhole camera out of it, and used Rapid paper as his "film." If you liked what you saw, you simply gave it a fixing bath, otherwise it went in the trash. The downside was that the image tone was purple.